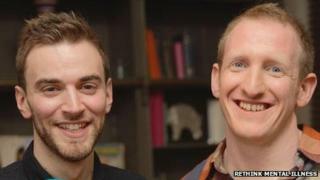 A video blogger who was stopped by a stranger from jumping into the River Thames has been reunited with the man who saved him six years ago. Jonny Benjamin, 26, was on Waterloo Bridge in January 2008 after being diagnosed with schizoaffective disorder when Neil Laybourn intervened. This month Mr Benjamin started a Twitter campaign using the hashtag #findmike, to trace his Good Samaritan. Mr Laybourn said that when he saw the tweet he knew it referred to him. The pair were reunited on Tuesday. Mr Benjamin had climbed up on to a ledge on the bridge after spending a month in hospital following his diagnosis, but Mr Laybourn talked to him and offered to buy him a coffee. The 31-year-old from Surrey, said: "It was a very cold day, a very windy day, and Jonny just had a T-shirt on and was sitting over the edge of the bridge and it was glaringly obvious why he was there. "I walked up around him and just calmly approached him and I said: 'Hi mate, can you tell me why you're sitting on the bridge?' and he told me that he was going to take his life that day. "We just went from there, I just kept asking him questions and wanted to engage him and that if he wanted to talk I was there," Mr Laybourn added. Mr Benjamin said he had gone to the bridge after feeling his life had hit "rock bottom". He told BBC Radio 5 live Breakfast: "All I remember was standing on the edge of the bridge and this guy just coming up to me out of nowhere. "The pivotal moment for me was when he said 'you can get through this, you can get better' because up until that point no-one had said it would get better." Mr Laybourn said that he offered to take Jonny for a coffee to talk things through but that never happened. Mr Benjamin said: "They [police] took me away and I never got a chance to say thank you to Neil which is why I launched this campaign - we never got a chance to go for that coffee and I've just been so grateful to him ever since." The #findmike Twitter campaign trended in countries including Canada, South Africa and Australia, but it was Mr Laybourn's fiancée who saw the campaign tweet. He said: "She saw it on her phone a couple of days after it had gone viral, and straightaway she called me up and as soon as I looked at it I saw how big it was, so I just got in touch as soon as I could really. "It was incredible [meeting Jonny], really nice, very emotional for both of us and really nice to have a conclusion to it and to hear Johnny's side of things that day." Mr Benjamin said meeting Mr Laybourn had made him feel "elated". He said: "When I went to the bridge I was so embarrassed about what I was going through, I couldn't tell anyone, but that simple act of telling Neil and having him listen made all the difference." Mr Benjamin, a video blogger who has presented a BBC Three documentary on mental illness, is also making a documentary film about his search for his Good Samaritan which he hopes will be broadcast in the spring. Schizoaffective disorder affects about 1 in 200 people and those suffering have very high or very low moods, and might lose touch with reality, the charity Rethink Mental Illness said.